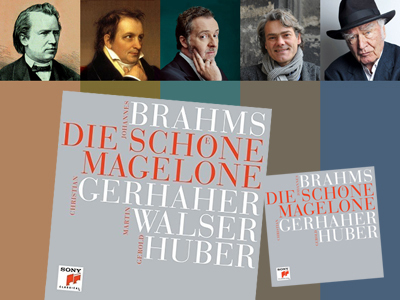 MUNICH — Sony has released a remarkable recording of Brahms’s Magelone-Romanzen, Op. 33, complete with Zwischentexte prepared by German author Martin Walser. Christian Gerhaher sings the fifteen songs and recites two of the other three poems (the 1st, 16th and 17th) from Ludwig Tieck’s 1797 narrative not set to music. Walser, 87 at the time of the recording, reads his own choice of eloquent, plain words, condensing Tieck’s eighteen-section prose while still advancing the tale and earmarking each song, as Brahms would have expected. Between the two of them, the German language has never sounded more beautiful. Gerold Huber accompanies. Sessions stretched over five days, at Bayerischer Rundfunk here, an indication of the care taken. This 93-minute, 2-CD release, with booklet essay and Romanze texts in German only, has EAN 088985 3110223 and ASIN B01NA7L2AN and must be distinguished from the widely reviewed single-disc issue omitting Walser’s work. Essential listening. This entry was posted on Monday, October 16th, 2017 at 6:33 am	and is filed under Munich Times. You can follow any responses to this entry through the RSS 2.0 feed. Both comments and pings are currently closed.